Non-alcoholic fatty liver disease (NAFLD) is common and may progress to cirrhosis and its complications. The pathogenesis of steatosis and cellular injury is thought to be related mostly to insulin resistance and oxidative stress. Therefore, management entails identification and treatment of metabolic risk factors, improving insulin sensitivity, and increasing antioxidant defences in the liver. Weight loss and exercise improve insulin sensitivity. Bariatric surgery may improve liver histology in patients with morbid obesity. Insulin sensitising drugs showed promise in pilot trials as have a number of hepatoprotective agents. Further randomised, well controlled trials are required to determine the efficacy of these drugs. The pathogenesis of NAFLD is not fully understood, however the finding that not all patients with steatosis develop hepatic inflammation and hepatocellular damage has led to the hypothesis that different pathogenic factors lead firstly to hepatic steatosis and secondly to hepatic damage (“the second hit”).4 Accumulation of hepatic fat is closely linked to insulin resistance, which increases lipolysis of peripheral adipose tissue with resultant increased fat influx into the liver in the form of free fatty acids. Furthermore, insulin resistance promotes de novo triglyceride synthesis within the liver and inhibits fatty acid oxidation thereby promoting triglyceride accumulation.5 Therefore, improving insulin sensitivity has been a key strategy in the treatment of NAFLD. NAFLD exists as a histological spectrum of changes; simple steatosis refers to >5% hepatic steatosis in the absence of significant inflammation and hepatocellular damage whereas non-alcoholic steatohepatitis (NASH) demonstrates inflammation and hepatocellular damage and sometimes fibrosis.8 NAFLD may be progressive resulting in cirrhosis that may be complicated by hepatocellular carcinoma and liver failure. Overall, about 5% of patients with NAFLD develop cirrhosis over an average of a seven year period with 1.7% dying from complications of liver cirrhosis.9 The high prevalence and chronic nature NAFLD subsequently translates to a significant health burden for the general community. In addition, subjects with a diagnosis of NAFLD have a higher risk of all cause mortality than the general population.9 This may be partly related to an increased risk of liver related death, but may also be related to death from vascular disease as a result of underlying metabolic abnormalities and insulin resistance. Thus treatment of patients with NAFLD should aim to identify and treat associated metabolic factors such as obesity, glucose intolerance, dyslipidaemia, and hypertension. Secondly, treatment aimed at preventing progressive liver injury should be offered to those considered to be at risk. Diabetes mellitus and obesity are risk factors for progressive hepatic fibrosis,10,11 and diabetes is also a risk factor for death in patients with NAFLD.9,12 Histological features also assist in stratifying patient risk of progressive liver disease. Simple steatosis is comparatively benign with a 0%–4% risk of developing cirrhosis over a one to two decade period.13–15 In contrast, 5%–8% of patients with NASH may develop cirrhosis over approximately five years.16–18 Assessment of fibrosis stage is also valuable in prognosticating risk of developing liver related morbidity, with patients with advanced fibrosis (bridging fibrosis and cirrhosis) at most risk. Although these features aid in stratifying patients at risk, a significant proportion of patients will have all of these adverse prognostic markers but will not develop liver related morbidity or mortality. Thus accurate prediction of those patients who will benefit most from treatment is difficult. The diagnosis of NAFLD requires confirmation of hepatic steatosis by imaging or liver biopsy with clinical exclusion of excessive (>20 g/day) alcohol ingestion.8 Ultrasound, computed tomography, or magnetic resonance studies can confirm the presence of hepatic steatosis with a comparatively high degree of accuracy.19 Ultrasound is comparatively cheap and readily available but is less sensitive at detecting minimal (<30%) steatosis or among obese patients.20 Thus a negative ultrasound does not necessarily exclude NAFLD. Liver biopsy is the gold standard for diagnosis and is the only investigation able to distinguish between simple steatosis and NASH or stage the degree of fibrosis.21 The decision to perform a liver biopsy must be individualised and may be useful when there is diagnostic uncertainty (for example, in the presence of raised iron parameters, auto-antibodies, or suspected coexisting drug toxicity) or to provide prognositication regarding outcome. Liver biopsy may also be performed in patients with risk factors of advanced fibrosis (diabetes, obesity, age >45, AST:ALT>1)22 where a diagnosis of cirrhosis has implications for screening for varices and hepatocellular carcinoma. The metabolic syndrome and its features of central obesity (waist circumference ⩾94 cm for men, ⩾80 cm for women), glucose intolerance (fasting glucose ⩾6.10 mmol/l), hypertriglyceridaemia (>1.70 mmol/l), low HDL cholesterol (<1.30 mmol/l in women, <1.03 mmol/l in men), and hypertension (⩾135/80 mm Hg) are associated with cardiovascular morbidity and mortality.23,24 These features are commonly present in subjects with NAFLD, with 67%–71% being obese, 12%–37% having impaired fasting glycaemia, 57%–68% having disturbed lipid profiles, and 36%–70% being hypertensive.1,9,25 Therefore, patients with newly diagnosed NAFLD should be screened for these conditions and appropriate treatment instituted in an effort to ameliorate the vascular risk as well as to improve NAFLD. Moderate amounts of weight loss as well as exercise are associated with improvement in insulin sensitivity and thus are logical treatment modalities for patients with NAFLD who are overweight or obese.26,27 Weight reduction may be achieved by caloric restriction from dieting, physical exercise, and/or pharmacotherapeutic agents as well as bariatric surgery in those patients with morbid obesity who are candidates for bariatric surgery. In an effort to assist weight loss, various pharmacotherapeutic agents have been evaluated. Orlistat is a lipase inhibitor that reduces fat absorption and promotes weight loss. A small pilot study showed improvement in aminotransaminases with a mean 10 kg weight loss after six months of orlistat.38 A non-significant reduction in steatosis was seen. Anorectic drugs such as fenfluramine and phentermine in addition to dietary and behavioural modifications were reported to improve aminotransaminase levels in 11 obese patients,39 but these drugs may induce cardiovascular and lung toxicity and they have been withdrawn from the market. More recently, sibutramine was associated with weight loss and improvement in alanine aminotransferase (ALT) and aspartate aminotransferase (AST) over six months in 13 patients.40 Histology was not assessed, however, regression of hepatic steatosis as determined by ultrasound, occurred in 11 patients. The same series found similar improvements in 12 patients who were assigned to orlistat. In summary, the evidence of efficacy of diet and exercise in patients with NAFLD is surprisingly scant. However, as it is comparatively safe, inexpensive, and has other health benefits, it should remain the first line among patients with NAFLD and increased BMI. Patients with NAFLD and normal BMI still have some degree of insulin resistance; physical exercise in itself improves insulin resistance and thus NAFLD among subjects who are not obese or overweight based on BMI measurements. Some patients with normal BMI and NAFLD meet criteria for central obesity, and thus, waist circumference needs to be recorded in all patients with NAFLD regardless of BMI. Rapid weight loss attributable to very low calorie dieting or bariatric surgery risks exacerbation of liver injury and should be avoided. The risk/benefit of long term drugs for weight loss has not been clarified. It is well established that insulin resistance is a common association with patients with NAFLD and plays an important part in lipid accumulation within the liver and perhaps its progression to NASH.7,51 In keeping with this, insulin resistance is predictive of the necroinflammatory form of NAFLD and conditions associated with insulin resistance such as obesity and diabetes are associated with the presence of advanced fibrosis among subjects with NASH.22,47 This had provided the impetus to trial insulin sensitising drugs such as metformin and the thiozoladinediones in NAFLD. Metformin is a biguanide antihyperglycaemic agent whose mechanism of action is not well understood.52 In animal models of fatty liver, metformin improved hepatic steatosis, which was accompanied by down-regulation of TNFα and lipid transcription factors.53 Several small pilot trials of four to six months’ duration using doses of 1–1.5 g/day, have showed improvement in ALT levels compared with baseline (table 3).54–56 Interestingly, a longer pilot trial using up to 2 g/day found no difference in ALT levels after 12 months’ treatment despite initial improvement at three months.57 Ten patients in this trial underwent biopsies at the end of treatment; improvement in steatosis was seen in one third of patients, inflammation in 20%, and fibrosis in 10%. A larger open label study from Italy randomised non-diabetic subjects to 2 g/day metformin (n = 55), diet (n = 27), or 800 IU/day vitamin E (n = 28).58 Significantly more subjects taking metformin had normalisation of ALT levels compared with those taking vitamin E or diet treatment. Follow up liver biopsy was performed in 17 of the 55 subjects assigned to metformin therapy; significant improvements were seen in steatosis, inflammation, and fibrosis compared with baseline. Although encouraging, these results need to be reproduced in larger and well controlled clinical trials before assuming metformin is an effective and safe treatment for patients with NAFLD. Lactic acidosis is a feared complication of metformin therapy, although it is rare and primarily seen among patients with renal or cardiac failure.59 However, the risk among patients with advanced liver fibrosis has not been well studied. In the few studies to date, 0%–7% of patients taking metformin therapy had increased lactate levels but not acidosis.54,56–58 Very few patients taking metformin had cirrhosis and thus it remains unclear whether it is safe to prescribe metformin in these patients. Two well designed pilot trials using pioglitazone (30 mg daily) and rosiglitazone (4 mg twice daily) showed improvement in ALT, hepatic steatosis, and features of hepatic inflammation compared with baseline.66,67 Pioglitazone but not rosiglitazone was associated with improvement in the overall fibrosis stage. A randomised trial of 20 non-diabetic patients with NASH comparing pioglitazone (30 mg/day) plus vitamin E (400 IU/day) with vitamin E (400 IU/day) alone, found both groups improved hepatic steatosis grade compared with baseline, although the degree of improvement with pioglitazone was greater; features of hepatic inflammation also improved in the pioglitazone group compared with baseline.68 Comparing treatments at the end of the study however, found no difference in ALT, steatosis grade, or fibrosis stage between groups, although hepatic inflammation were significantly less in the pioglitazone group. Interpretation of these studies without a placebo group is difficult, as ALT levels, hepatic steatosis, and inflammation tend to improve over time as fibrosis progresses in NAFLD.10,11 Weight gain with fat redistribution from the central/truncal area to the lower body was the most common side effect occurring in 67%–72% of subjects taking pioglitazone or roziglitazone.66,67 Of concern, 1 of 30 subjects in the rosiglitazone trial and 1 of 10 patients taking pioglitazone were withdrawn because of hepatotoxicity.66,68 Although definitive cause-effect was not proved, potential hepatotoxicity in the setting of liver disease remains a concern. Subjects with NAFLD exhibit increased levels of oxidative stress and lipid peroxidation that may play a part in disease progression.69,70 Vitamin E is a potent antioxidant and has been evaluated among paediatric and adult patients with NAFLD (table 4). Two small pilot trials have shown reduction of ALT levels among adult and paediatric patients with NASH. Subsequently, two small randomised controlled trials have failed to show any benefit of vitamin E on ALT levels; one study randomised 16 adult subjects to vitamin E (800 IU/day) or no treatment over three months71; the other trial consisted of 28 obese children taking vitamin E (400 mg/daily for two months, 100 mg/daily for three months) or placebo.72 In the only randomised study assessing histology, Harrison and colleagues randomised 45 patients to vitamins E (1000 IU/day) and C (1000 mg/day) or placebo for six months.73 Vitamin treatment significantly improved hepatic inflammation and fibrosis compared with baseline. However, the comparison of changes between placebo and vitamin E/C groups occurring with treatment at the end of the study showed no differences in ALT, hepatic inflammation or fibrosis. Recent evidence has also suggested that vitamin E supplementation may not be innocuous but may be associated with an increased risk of death and heart failure.74 Therefore in the absence of convincing evidence of benefit and the possible spectre of harm, vitamin E cannot be recommended for treatment of NAFLD outside of clinical trials. Probucol is a lipid lowering antioxidant, which after showing promise in a pilot trial,75 improved ALT levels compared with placebo in a six month randomised trial.76 However, probucol is not universally available and has been withdrawn from Australia and the USA after concern regarding its pro-arrhythmic potential. Angiotensin II promotes insulin resistance and hepatic fibrosis in animal models. Losartan is an antagonist against the angiotensin II receptor that improved aminotransaminases, serum markers of fibrosis, and levels of profibrotic cytokine transforming growth factor β1 in a pilot trial of seven subjects with NASH.80 Significant histological improvement was not seen, although this may have been because of lack of power. Ursodeoxycholic acid (UDCA) has anti-inflammatory, immune modulating, and antiapoptotic properties and is widely used in chronic cholestatic liver diseases. After promising results from several pilot studies, a large randomised placebo controlled study recently found no effect on liver biochemistry or histology.81–83 In that study81 a significant improvement in the liver enzymes and degree of steatosis was found at two years of treatment as compared with baseline; this significant improvement in liver enzymes and steatosis was also seen in the placebo group. The improvement seen with UDCA treatment was not significantly better than that seen in the placebo group.81 Based on this study, UDCA is not recommended for the treatment of NAFLD. Intestinal derived bacterial endotoxin seems to sensitise animal model fatty livers to the effects of TNFα with subsequent liver damage.84 Consequently, probiotics have been shown to ameliorate liver injury in these models.85 Administration of the probiotic VSL no 3 to 22 NAFLD patients over three months improved ALT levels as well as markers of lipid peroxidation.86 Effects on histology are unknown. Increased understanding of the pathogenesis of NAFLD and particularly the factors responsible for progressive liver injury, will permit better targeting of therapeutic agents. Adiponectin is a hormone secreted by adipose tissue that has insulin sensitising as well as apparent hepatoprotective effects and thus may play a part in hepatic fat accumulation as well as liver injury in patients with NAFLD. Supplementation of adiponectin led to improvement in hepatic steatosis and ALT levels to animal models of NAFLD.90 Human studies have not been performed. NAFLD is now acknowledged to be the commonest liver condition in the western world, largely because of the considerable increase in metabolic diseases such as obesity and diabetes. It is clear that NAFLD leads to liver related morbidity and mortality in a subset of people, particularly those who are obese, diabetic, and who have NASH. However, a better understanding of the natural history of NAFLD will permit better identification of at risk patients who should be targeted for long term and potentially expensive treatment. 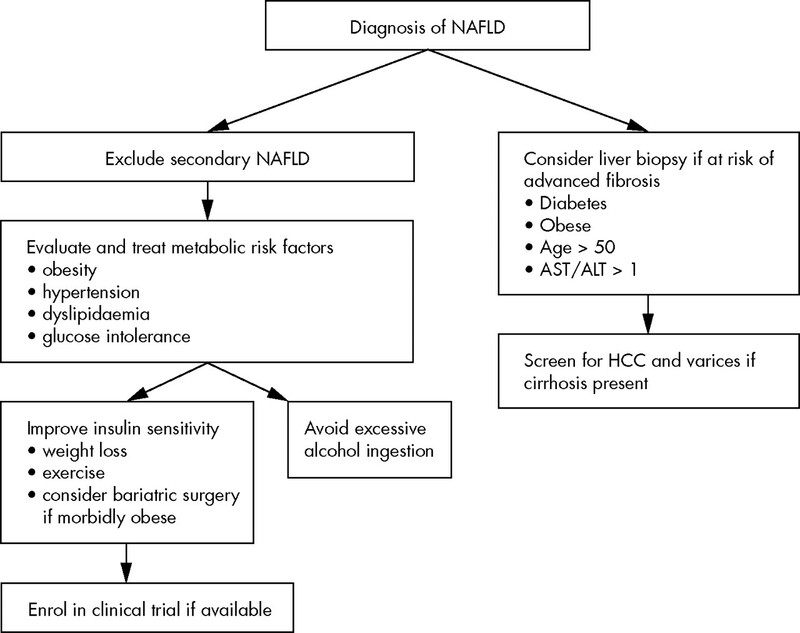 Treatment of NAFLD should begin with screening and managing metabolic risk factors that may modify the risk of liver disease as well as non-liver related disease such as ischaemic heart disease. First line treatment should consist of lifestyle change with weight loss and exercise to improve insulin sensitivity. However, because of long term compliance difficulties, pharmaceutical agents aimed at reducing insulin resistance or protecting the liver from additional insults are needed. Many pilot trials have shown promising initial results in improving liver enzymes or features of liver histology. However, the efficacy of these agents still remains in question, and none of them can yet be recommended outside of clinical trials. Furthermore, the cost effectiveness of pharmacological therapy of NAFLD has to be defined. Some randomised, double blind, placebo controlled trials evaluating pioglitazone, metformin, vitamin E, betaine, and silymarin are currently in progress, in both adults and children. These trials will hopefully provide new therapeutic options for the clinician in the near future. 1. (A) T, (B) T, (C) T, (D) F; 2. (A) T, (B) T, (C) F, (D) T; 3. (A) T, (B) T, (C) T, (D) F; 4. (A) T, (B) F, (C) T, (D) F; 5. (A) F, (B) F, (C) F, (D) F.
Browning J , Szczepaniak L, Dobbins R, et al. Prevalence of hepatic steatosis in an urban population in the United States: impact of ethnicity. Hepatology2004;40:1387–95. Nomura H , Kashiwagi S, Hayashi J, et al. Prevalence of fatty liver in a general population of Okinawa, Japan. Jpn J Med1988;27:142–9. Angulo P . Nonalcoholic fatty liver disease. N Engl J Med2002;346:1221–31. Day CP, James OF. Steatohepatitis: a tale of two “hits”? Gastroenterology1998;114:842–5. Browning JD, Horton JD. Molecular mediators of hepatic steatosis and liver injury. J Clin Invest2004;114:147–52. Haque M , Sanyal AJ. The metabolic abnormalities associated with non-alcoholic fatty liver disease. Best Pract Res Clin Gastroenterol2002;16:709–31. Paradis V , Perlemuter G, Bonvoust F, et al. High glucose and hyperinsulinemia stimulate connective tissue growth factor expression: a potential mechanism involved in progression to fibrosis in nonalcoholic steatohepatitis. Hepatology2001;34:738–44. Neuschwander-Tetri BA, Caldwell SH. Nonalcoholic steatohepatitis: summary of an AASLD single topic conference. Hepatology2003;37:1202–19. Adams LA, Lymp J, St Sauver J, et al. The natural history of nonalcoholic fatty liver disease: a population based cohort study. Gastroenterology2005;129:113–21. Fassio E , Alvarez E, Dominguez N, et al. Natural history of nonalcoholic steatohepatitis: a longitudinal study of repeat liver biopsies. Hepatology2004;40:820–6. Adams LA, Sanderson S, Lindor KD, et al. The histological course of nonalcoholic fatty liver disease: a longitudinal study of 103 patients with sequential liver biopsies. J Hepatol2005;42:132–8. Younossi ZM, Gramlich T, Matteoni CA, et al. Nonalcoholic fatty liver disease in patients with type 2 diabetes. Clin Gastroenterol Hepatol2004;2:262–5. Matteoni CA, Younossi ZM, Gramlich T, et al. Nonalcoholic fatty liver disease: a spectrum of clinical and pathological severity. Gastroenterology1999;116:1413–19. Dam-Larsen S , Franzmann M, Andersen IB, et al. Long term prognosis of fatty liver: risk of chronic liver disease and death. Gut2004;53:750–5. Teli MR, James OF, Burt AD, et al. The natural history of nonalcoholic fatty liver: a follow-up study. Hepatology1995;22:1714–19. Lee RG. Nonalcoholic steatohepatitis: a study of 49 patients. Hum Pathol1989;20:594–8. Cortez-Pinto H , Baptista A, Camilo ME, et al. Nonalcoholic steatohepatitis--a long-term follow-up study: comparison with alcoholic hepatitis in ambulatory and hospitalized patients. Dig Dis Sci2003;48:1909–13. Powell EE, Cooksley WG, Hanson R, et al. The natural history of nonalcoholic steatohepatitis: a follow-up study of forty-two patients for up to 21 years. Hepatology1990;11:74–80. Joy D , Thava VR, Scott BB. Diagnosis of fatty liver disease: is biopsy necessary? Eur J Gastroenterol Hepatol2003;15:539–43. Mottin CC, Moretto M, Padoin AV, et al. The role of ultrasound in the diagnosis of hepatic steatosis in morbidly obese patients. Obes Surg2004;14:635–7. Saadeh S , Younossi ZM, Remer EM, et al. The utility of radiological imaging in nonalcoholic fatty liver disease. Gastroenterology2002;123:745–50. Angulo P , Keach JC, Batts KP, et al. Independent predictors of liver fibrosis in patients with nonalcoholic steatohepatitis. Hepatology1999;30:1356–62. Hunt KJ, Resendez RG, Williams K, et al. National Cholesterol Education Program versus World Health Organization metabolic syndrome in relation to all-cause and cardiovascular mortality in the San Antonio heart study. Circulation2004;110:1251–7. Malik S , Wong ND, Franklin SS, et al. Impact of the metabolic syndrome on mortality from coronary heart disease, cardiovascular disease, and all causes in United States adults. Circulation2004;110:1245–50. Fan JG, Zhu G, Li XJ, et al. Prevalence of and risk factors for fatty liver in a general population of Shanghai China. J Hepatol2005;43:508–13. Petersen KF, Dufour S, Befroy D, et al. Reversal of nonalcoholic hepatic steatosis, hepatic insulin resistance, and hyperglycemia by moderate weight reduction in patients with type 2 diabetes. Diabetes2005;54:603–8. Houmard JA, Tanner CJ, Slentz CA, et al. Effect of the volume and intensity of exercise training on insulin sensitivity. J Appl Physiol2004;96:101–6. Andersen T , Gluud C, Franzmann MB, et al. Hepatic effects of dietary weight loss in morbidly obese subjects. J Hepatol1991;12:224–9. Huang MA, Greenson JK, Chao C, et al. One-year intense nutritional counseling results in histological improvement in patients with non-alcoholic steatohepatitis: a pilot study. Am J Gastroenterol2005;100:1072–81. Okita M , Hayashi M, Sasagawa T, et al. Effect of a moderately energy-restricted diet on obese patients with fatty liver. Nutrition2001;17:542–7. Palmer M , Schaffner F. Effect of weight reduction on hepatic abnormalities in overweight patients. Gastroenterology1990;99:1408–13. Ueno T , Sugawara H, Sujaku K, et al. Therapeutic effects of restricted diet and exercise in obese patients with fatty liver. J Hepatol1997;27:103–7. Musso G , Gambino R, De Michieli F, et al. Dietary habits and their relations to insulin resistance and postprandial lipemia in nonalcoholic steatohepatitis. Hepatology2003;37:909–16. Fernandez MI, Torres MI, Gil A, et al. Steatosis and collagen content in experimental liver cirrhosis are affected by dietary monounsaturated and polyunsaturated fatty acids. Scand J Gastroenterol1997;32:350–6. Hatzitolios A , Savopoulos C, Lazaraki G, et al. Efficacy of omega-3 fatty acids, atorvastatin and orlistat in non-alcoholic fatty liver disease with dyslipidemia. Indian J Gastroenterol2004;23:131–4. Foster GD, Wyatt HR, Hill JO, et al. A randomized trial of a low-carbohydrate diet for obesity. N Engl J Med2003;348:2082–90. Stern L , Iqbal N, Seshadri P, et al. The effects of low-carbohydrate versus conventional weight loss diets in severely obese adults: one-year follow-up of a randomized trial. Ann Intern Med2004;140:778–85. Harrison SA, Fincke C, Helinski D, et al. A pilot study of orlistat treatment in obese, non-alcoholic steatohepatitis patients. Aliment Pharmacol Ther2004;20:623–8. Kazi N , DeMeo M, Mikolaitis S. Effects of weight loss on abnormal liver function test (LFT) in obese patients. FASEB J1997;A600:3466. Sabuncu T , Nazligul Y, Karaoglanoglu M, et al. The effects of sibutramine and orlistat on the ultrasonographic findings, insulin resistance and liver enzyme levels in obese patients with non-alcoholic steatohepatitis. Rom J Gastroenterol2003;12:189–92. Dixon JB, Bhathal PS, Hughes NR, et al. Nonalcoholic fatty liver disease: Improvement in liver histological analysis with weight loss. Hepatology2004;39:1647–54. Kral JG, Thung SN, Biron S, et al. Effects of surgical treatment of the metabolic syndrome on liver fibrosis and cirrhosis. Surgery2004;135:48–58. Luyckx FH, Desaive C, Thiry A, et al. Liver abnormalities in severely obese subjects: effect of drastic weight loss after gastroplasty. Int J Obes Relat Metab Disord1998;22:222–6. Silverman EM, Sapala JA, Appelman HD. Regression of hepatic steatosis in morbidly obese persons after gastric bypass. Am J Clin Pathol1995;104:23–31. Campbell JM, Hunt TK, Karam JH, et al. Jejunoileal bypass as a treatment of morbid obesity. Arch Intern Med1977;137:602–10. Marubbio AT Jr, Buchwald H, Schwartz MZ, et al. Hepatic lesions of central pericellular fibrosis in morbid obesity, and after jejunoileal bypass. Am J Clin Pathol1976;66:684–91. Dixon JB, Bhathal PS, O’Brien PE. Nonalcoholic fatty liver disease: predictors of nonalcoholic steatohepatitis and liver fibrosis in the severely obese. Gastroenterology2001;121:91–100. Vajro P , Fontanella A, Perna C, et al. Persistent hyperaminotransferasemia resolving after weight reduction in obese children. J Pediatr1994;125:239–41. Franzese A , Vajro P, Argenziano A, et al. Liver involvement in obese children. Ultrasonography and liver enzyme levels at diagnosis and during follow-up in an Italian population. Dig Dis Sci1997;42:1428–32. Rashid M , Roberts EA. Nonalcoholic steatohepatitis in children. J Pediatr Gastroenterol Nutr2000;30:48–53. Marchesini G , Brizi M, Morselli-Labate AM, et al. Association of nonalcoholic fatty liver disease with insulin resistance. Am J Med1999;107:450–5. Hundal RS, Inzucchi SE. Metformin: new understandings, new uses. Drugs2003;63:1879–94. Lin HZ, Yang SQ, Chuckaree C, et al. Metformin reverses fatty liver disease in obese, leptin-deficient mice. Nat Med2000;6:998–1003. Marchesini G , Brizi M, Bianchi G, et al. Metformin in non-alcoholic steatohepatitis. Lancet2001;358:893–4. Magalotti D , Marchesini G, Ramilli S, et al. Splanchnic haemodynamics in non-alcoholic fatty liver disease: effect of a dietary/pharmacological treatment. A pilot study. Dig Liver Dis2004;36:406–11. Schwimmer JB, Middleton MS, Deutsch R, et al. A phase 2 clinical trial of metformin as a treatment for non-diabetic paediatric non-alcoholic steatohepatitis. Aliment Pharmacol Ther2005;21:871–9. Nair S , Diehl AM, Wiseman M, et al. Metformin in the treatment of non-alcoholic steatohepatitis: a pilot open label trial. Aliment Pharmacol Ther2004;20:23–8. Bugianesi E , Gentilcore E, Manini R, et al. A randomized controlled trial of metformin versus vitamin E or prescriptive diet in nonalcoholic fatty liver disease. Am J Gastroenterol2005;100:1082–90. Misbin RI. The phantom of lactic acidosis due to metformin in patients with diabetes. Diabetes Care2004;27:1791–3. Shadid S , Jensen MD. Effects of pioglitazone versus diet and exercise on metabolic health and fat distribution in upper body obesity. Diabetes Care2003;26:3148–52. Kawaguchi K , Sakaida I, Tsuchiya M, et al. Pioglitazone prevents hepatic steatosis, fibrosis, and enzyme-altered lesions in rat liver cirrhosis induced by a choline-deficient L-amino acid-defined diet. Biochem Biophys Res Commun2004;315:187–95. Yuan GJ, Zhang ML, Gong ZJ. Effects of PPARg agonist pioglitazone on rat hepatic fibrosis. World J Gastroenterol2004;10:1047–51. Caldwell SH, Hespenheide EE, Redick JA, et al. A pilot study of a thiazolidinedione, troglitazone, in nonalcoholic steatohepatitis. Am J Gastroenterol2001;96:519–25. Menon KVN, Angulo P, Lindor KD. Severe cholestatic hepatitis from troglitazone in a patient with nonalcoholic steatohepatitis and diabetes mellitus. Am J Gastroenterol2001;96:1631–4. Marcy TR, Britton ML, Blevins SM. Second-generation thiazolidinediones and hepatotoxicity. Ann Pharmacother2004;38:1419–23. Neuschwander-Tetri BA, Brunt EM, Wehmeier KR, et al. Improved nonalcoholic steatohepatitis after 48 weeks of treatment with the PPAR-gamma ligand rosiglitazone. Hepatology2003;38:1008–17. Promrat K , Lutchman G, Uwaifo GI, et al. A pilot study of pioglitazone treatment for nonalcoholic steatohepatitis. Hepatology2004;39:188–96. Sanyal AJ, Mofrad PS, Contos MJ, et al. A pilot study of vitamin E versus vitamin E and pioglitazone for the treatment of nonalcoholic steatohepatitis. Clin Gastroenterol Hepatol2004;2:1107–15. Yesilova Z , Yaman H, Oktenli C, et al. Systemic markers of lipid peroxidation and antioxidants in patients with nonalcoholic Fatty liver disease. Am J Gastroenterol2005;100:850–5. Sanyal AJ, Campbell-Sargent C, Mirshahi F, et al. Nonalcoholic steatohepatitis: association of insulin resistance and mitochondrial abnormalities. Gastroenterology2001;120:1183–92. Kugelmas M , Hill DB, Vivian B, et al. Cytokines and NASH: a pilot study of the effects of lifestyle modification and vitamin E. Hepatology2003;38:413–19. Vajro P , Mandato C, Franzese A, et al. Vitamin E treatment in pediatric obesity-related liver disease: a randomized study. J Pediatr Gastroenterol Nutr2004;38:48–55. Harrison SA, Torgerson S, Hayashi P, et al. Vitamin E and vitamin C treatment improves fibrosis in patients with nonalcoholic steatohepatitis. Am J Gastroenterol2003;98:2485–90. Guallar E , Hanley DF, Miller ER 3rd. n editorial update: Annus horribilis for vitamin E. Ann Intern Med2005;143:143–5. Merat S , Malekzadeh R, Sohrabi MR, et al. Probucol in the treatment of nonalcoholic steatohepatitis: an open-labeled study. J Clin Gastroenterol2003;36:266–8. Merat S , Malekzadeh R, Sohrabi MR, et al. Probucol in the treatment of non-alcoholic steatohepatitis: a double-blind randomized controlled study. J Hepatol2003;38:414–18. Satapathy SK, Garg S, Chauhan R, et al. Beneficial effects of tumor necrosis factor-alpha inhibition by pentoxifylline on clinical, biochemical, and metabolic parameters of patients with nonalcoholic steatohepatitis. Am J Gastroenterol2004;99:1946–52. Adams LA, Zein CO, Angulo P, et al. A pilot trial of pentoxifylline in nonalcoholic steatohepatitis. Am J Gastroenterol2004;99:2365–8. Abdelmalek MF, Angulo P, Jorgensen RA, et al. Betaine, a promising new agent for patients with nonalcoholic steatohepatitis: results of a pilot study. Am J Gastroenterol2001;96:2711–17. Yokohama S , Yoneda M, Haneda M, et al. Therapeutic efficacy of an angiotensin II receptor antagonist in patients with nonalcoholic steatohepatitis. Hepatology2004;40:1222–5. Kiyici M , Gulten M, Gurel S, et al. Ursodeoxycholic acid and atorvastatin in the treatment of nonalcoholic steatohepatitis. Can J Gastroenterol2003;17:713–18. Laurin J , Lindor KD, Crippin JS, et al. Ursodeoxycholic acid or clofibrate in the treatment of non-alcohol-induced steatohepatitis: a pilot study. Hepatology1996;23:1464–7. Lindor KD, Kowdley KV, Heathcote EJ, et al. Ursodeoxycholic acid for treatment of nonalcoholic steatohepatitis: results of a randomized trial. Hepatology2004;39:770–8. Yang SQ, Lin HZ, Lane MD, et al. Obesity increases sensitivity to endotoxin liver injury: implications for the pathogenesis of steatohepatitis. Proc Natl Acad Sci U S A1997;94:2557–62. Li Z , Yang S, Lin H, et al. Probiotics and antibodies to TNF inhibit inflammatory activity and improve nonalcoholic fatty liver disease. Hepatology2003;37:343–50. Loguercio C , Federico A, Tuccillo C, et al. Beneficial effects of a probiotic VSL#3 on parameters of liver dysfunction in chronic liver diseases. J Clin Gastroenterol2005;39:540–3. Chalasani N . Statins and hepatotoxicity: focus on patients with fatty liver. Hepatology2005;41:690–5. Rallidis LS, Drakoulis CK, Parasi AS. Pravastatin in patients with nonalcoholic steatohepatitis: results of a pilot study. Atherosclerosis2004;174:193–6. Basaranoglu M , Acbay O, Sonsuz A. A controlled trial of gemfibrozil in the treatment of patients with nonalcoholic steatohepatitis. J Hepatol1999;31:384. Xu A , Wang Y, Keshaw H, et al. The fat-derived hormone adiponectin alleviates alcoholic and nonalcoholic fatty liver diseases in mice. J Clin Invest2003;112:91–100. Tenenbaum A , Motro M, Fisman EZ. Dual and pan-peroxisome proliferator-activated receptors (PPAR) co-agonism: the bezafibrate lessons. Cardiovasc Diabetol2005;4:14. Clark JM, Alkhuraishi AR, Solga SF, et al. Roux-en-Y gastric bypass improves liver histology in patients with non-alcoholic fatty liver disease. Obes Res2005;13:1180–6. Bajaj M , Suraamornkul S, Pratipanawatr T, et al. Pioglitazone reduces hepatic fat content and augments splanchnic glucose uptake in patients with type 2 diabetes. Diabetes2003;52:1364–70. Shadid S , Jensen MD. Effect of pioglitazone on biochemical indices of non-alcoholic fatty liver disease in upper body obesity. Clin Gastroenterol Hepatol2003;1:384–7. Vajro P , Franzese A, Valerio G, et al. Lack of efficacy of ursodeoxycholic acid for the treatment of liver abnormalities in obese children. J Pediatr2000;136:739–43. Hasegawa T , Yoneda M, Nakamura K, et al. Plasma transforming growth factor-beta1 level and efficacy of alpha- tocopherol in patients with non-alcoholic steatohepatitis: a pilot study. Aliment Pharmacol Ther2001;15:1667–72. Lavine JE. Vitamin E treatment of nonalcoholic steatohepatitis in children: a pilot study. J Pediatr2000;136:734–8. Funding: LA is sponsored by a Postgraduate Medical Research Scholarship (no 353710) from the National Health and Medical Research Council as well as by the Athelstan and Amy Saw Postgraduate Medical Scholarship from The University of Western Australia.